DeCarlo Raspberry as Sebastian and cast performing “Under the Sea.” Photo: Jeri Tidwell Photography. Holy Mackerel! With the arrival of Disney’s “The Little Mermaid” at Toby’s, the Dinner Theatre of Columbia, it is tempting to bombard this review with a school of fish puns. But if you think I am going to take the bait, well, you are floundering up the wrong pike. I don’t mean to carp on this but there are enough fishy lines dropped throughout the show that with any more from me and you’d be up to your gills in them, wind up with a haddock, and eventually tuna me out. Based on one of Hans Christian Andersen’s most adored stories and the 1989 classic animated film, it was no fluke that Disney’s “The Little Mermaid” netted two Tony Award nominations in 2008. It features music by eight-time Academy Award winner, Alan Menken, lyrics by Howard Ashman and Glenn Slater and a book by Doug Wright. Mr. Minnick’s choreography is detailed and fluid working the in-the-round stage to near perfection. Grouper, I mean group numbers, such as “Daughters of Triton,” the clever “Positoovity,” the hilarious “Les Poissons,” “She’s in Love” and the show-stopper “Under the Sea” are expertly performed. This is no small achievement given the bulky costumes worn by the cast members, and the precise execution avoids collisions. Well done! …a lighthearted musical for all ages where you will enjoy this production and the buffet hook, line and sinker. 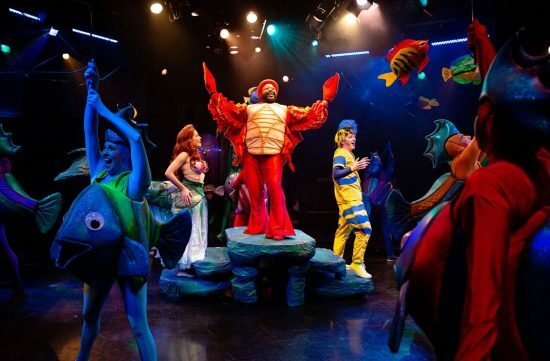 “The Little Mermaid” at Toby’s with its talented performers and crew under Mark Minnick’s excellent direction is a lighthearted musical for all ages where you will enjoy this production and the buffet hook, line and sinker. I said that just for the halibut. “The Little Mermaid” runs through January 13 at Toby’s the Dinner Theatre of Columbia, 4900 Symphony Woods Rd., Columbia, MD 21044. Tickets may be purchased by calling the box office at 410-730-8311 or visiting online.